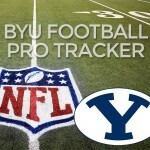 It was a great week in the NFL for Cougar faithful as several BYU alums recorded firsts for their seasons and careers. Dennis Pitta had his first touchdown reception since 2013 (and first career fumble), Kyle Van Noy recorded his first NFL interception, and Paul Lasike had his first kickoff return. All statistics, snap counts, and transactions for active players are recorded below. Paul Lasike (RB/FB, 2012-14; Chicago). Chicago (3-9) defeated San Francisco 26-6. Lasike was the starting fullback and had his first kickoff return, which he brought back for five yards. He played 12 snaps on offense (19%) and 11 snaps on special teams (38%). Season Totals: three carries for eight yards; one reception for three yards; one kickoff return for five yards. Dennis Pitta (TE, 2004, 2007-09; Baltimore). Baltimore (7-5) defeated Miami 38-6 to snap Miami’s six game win streak. Pitta started at tight end and was targeted eleven times and had nine receptions for 90 yards and two touchdowns. His touchdowns were his first since 2013. He also recorded his first career lost fumble. He played 34 snaps on offense (47%) and one snap on special teams (4%). Season Totals: 61 receptions for 529 yards, two touchdowns; one fumble lost. Daniel Sorensen (DB, 2008, 2011-13; Kansas City). The Chiefs (9-3) defeated Atlanta 29-28. Sorensen started at safety and had four solo and one assisted tackles and one pass deflection. He played 34 snaps on defense (46%) and 20 snaps on special teams (83%). Season Totals: 44 tackles (38 solo, 6 assisted); two TFL; four pass deflections; one forced fumble; two INT with one returned 48 yards for a TD; one sack. Kyle Van Noy (LB, 2010-13; New England). New England (10-2) defeated the LA Rams 26-10. Van Noy had his first NFL interception and also assisted on four tackles. He didn’t get the start but did see dramatically more playing time going for 41 snaps on defense (79%) and 16 on special teams (50%). Season Totals: 32 tackles (23 solo, nine assisted); one sack; one TFL; one pass deflection; one interception. Jordan Leslie has been everywhere this season. He was waived by the Atlanta Falcons in August, spent one week on the Tennessee Titans practice squad in September, and was added on October 18th to the Cleveland Browns practice squad. Rob Daniel (CB, 2013-14). Daniel spent 2015-16 on Green Bay practice squad and some time on 53 man roster. He was released after training camp in early September 2016 but was elevated to the Green Bay practice squad before week 3. That only lasted a week or so as he was waived by the Packers on September 25, 2016. However he was picked up by Baltimore and played 19 snaps (61%) on special teams (but recorded no stats) on an October 23 loss to the Jets. He was waived by the Ravens on November 5, 2016 but then re-activated to the practice squad on November 12th.